Review: Julie is a amateur chef and finds a cookery book by Julia Child who is a celebrity chef. Julie decides to make every recipe possible in the book. Just felt with this film that there wasn’t really a story to tell. It was a bit too long. 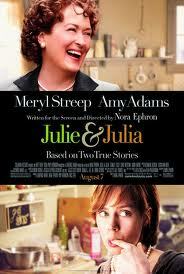 In 2010 Meryl Streep got an Oscar for the Best Performance by an actress in a Motion Picture – Comedy or Musical.